I have a good one for you today, given to me by a good friend of mine whom I shall name Istari. Due to the pending Rapture, I had not planned Mystery Monday (nor did my dishes – read: I was very very lazy this weekend) and had told her (with a touch of writer’s panic) that I had no idea what to write about. In the 1900’s, sponge divers working at theislandofAntikytheradiscovered a shipwreck approximately 60 metres down. The first diver found what he described as a scene of rotting corpses and horses lying on the sea bed. His fellow shipmates thought that he had gone mad so the captain of their team, a Dimitrios Kondos, decided to dive down for himself. When he came up with the bronze arm of a statue, the crew knew that they had struck gold and spent several days diving out as many of the small artifacts as they could. For the next year, the Greek Education Ministry and the Hellenic Navy salvaged as much from the sight as they could, including a bronze lyre, a statue of a young boy and a discus thrower and the Antikythera Ephebe – a 1.94m statue of a naked man (I dare you to call it otherwise…). On the 17th of May, 1902 – a archeologist named Valerios Stais was examining some of the stones that they had brought up from the sea bottom when he discovered a tiny gear embedded in it. What followed, blew scientists understanding of greek history out of the water. 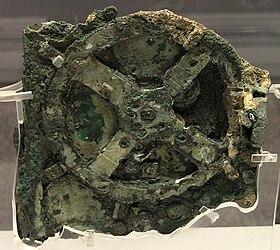 Valerios discovered the beginning of what we now know as the Antikythera Mechanism. 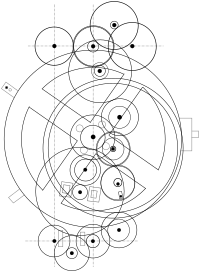 It is thought to be the oldest example of a mechanized clock – believed to be used to study the movement of planets around the earth and for other functions of astrology. Simple really? Just a giant calculator? The technology that it presented did not appear again for another thousand years. The mechanism had a carefully written set of instructions in Greek, implying that it was intended for use by someone who didn’t know how it worked. The instructions referred to various locations known in ancientGreece. A sort of “When you are here, do this with it…”set of instructions. It was small and could easily be transported. And, it could be used to calculate the rising and setting of certain stars on the horizon (implying once again that it was used for navigation). It even took the fact that there were 365.25 days per year into account. This was only introduced during 46BC, approximately three decades after the ship sank. For those years, it must’ve been a scientific wonder and – for us – it’s a Mystery. I can’t stop grinning. Honestly? I love this one. I have a theory, one which I can’t elaborate on as I’m exploring it in a story, lol, but I can only say that I believe that there was an ancient race of people on our planet. No, I don’t believe they were aliens. But, I believe that they could do things that we can only dream of now. I believe that these people, who might well have designed so many other mysteries on our planet, had made this in order to help the Greeks. But, proof to me, that there were more to our ancestors than we give them credit for.